BSF troops of Guwahati Frontier, deployed on Choudharyhat border in Coochbehar, West Bengal, apprehends one Indian woman with Bangladeshi Taka 1,55,000/-, while she was trying to take the consignment across the border to Bangladesh, today. 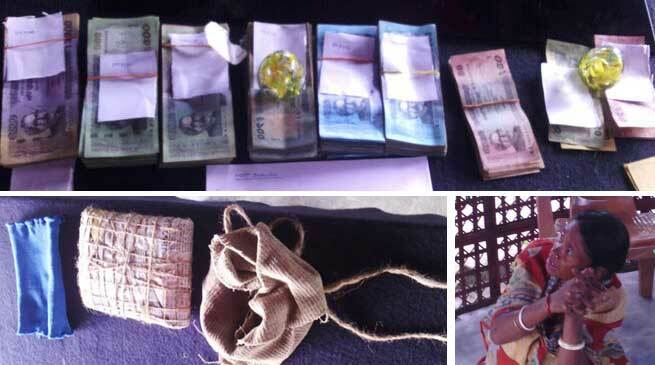 On specific input of BSF Intelligence Wing Coochbehar, about a likely attempt to smuggle out huge quantity of Bangladeshi currency, to Bangladesh, the BSF troops deployed on the border, including a detachment of Mahilla constables were on the look-out for the suspect. One Indian woman namely, Panchami Barman (59 yrs), wife/of-Deb Das Barman, resident of an Indian village lying ahead of the border fencing namely Jagirwalabari, PS-Dinhata, Coochbehar approached the BSF personnel to allow her to go to the other side of the fencing, on proper documents, to her village. As per the laid down procedure, the Mahilla constables of BSF carried out her search. During her search Mahila Constable inside an enclosure and detected a packet concealed beneath her clothes. Immediately they got possession of the suspicious packet and detained her. On opening the packet, huge quantities of Bangladeshi currency emerged from the packet. BD Taka-1,55000/- (in denominations as follows were found concealed in the packet : 1000X49= 49000, 500X155= 77500, 100X275= 27500 50X18=900, 20X2= 40, 10X6=60). The suspect was asked to explain the reasons why she was in possession of such huge quantities of BD Taka and when she could not justify, she was immediately apprehended by the troops, at the fencing gate itself. The source of the money is being inquired into and an extra alert has been issued to the BSF troops deployed in the area to check for such modus operandi of smugglers in transporting Bangladeshi currency from India to Bangladesh. The apprehended woman and the seized BD Taka has been handed over to PS Dinhata for further necessary action. BSF is committed to prevent trans-border crimes on the border in the midst of extreme adversities.